K ronomyth 12.0: WINGING IT ON HIS OWN. A McCartney solo album is never a good sign. The first signalled the breakup of The Beatles; the second, the breakup of Wings. I’m fairly certain McCartney III is mentioned by name in Revelations. 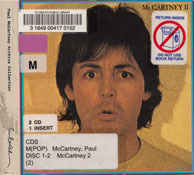 Of course, the breakup of Wings couldn’t be counted a disaster by any but Denny Laine and his dependents, and with an irresistible new song on the radio (“Coming Up”), McCartney II took its rightful place at the top of the charts. Those who heard the album were quickly struck by its new wave sensibilities; McCartney II is as close as Paul has come to making a Yoko Ono album. Synthesizers figure prominently in many of the songs, and the whole album has a herky-jerky feel to it. 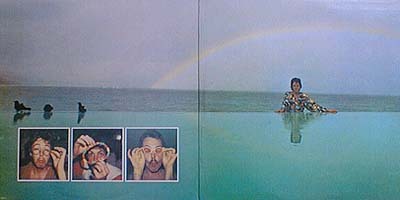 Saying McCartney II is underdone compared to London Town and Back To The Egg is misleading, since Paul has always taken a scrapbook approach into the studio. Yet the fact remains that the first McCartney album and McCartney II are different by design, as they find the artist at home on his own and unplugged from the star maker machinery. No doubt some people are galled by the mere existence of these albums, just as (presumably many) other people have gazed appreciatively into the window afforded by them. 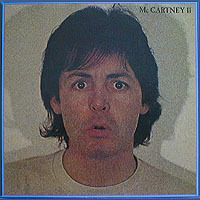 Compared to its earlier namesake, McCartney II features a stronger collection of actual songs, albeit filtered through a slightly distorted lens of synthesizers and pajama-time production. 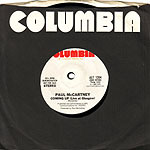 These songs are by turns too fast (“Coming Up,” “Temporary Secretary”) or too slow (“Waterfalls,” “One of These Days”), but at least listeners won’t be frustrated by tantalizing tidbits like “The Lovely Linda” or two too-short versions of “Junk.” Originally issued in the US with a one-sided, seven-inch single of “Coming Up (Live At Glasgow),” McCartney II has since been re-issued with a few bonus tracks (1993) and a bonus disc of unreleased and non-album tracks (2011) that features forty minutes of forgettable and sometimes regrettable music including “Rudolph the Half-Assed Reindeer” (a/k/a “Wonderful Christmastime”). © 2012 Connolly & Company. All rights reserved.